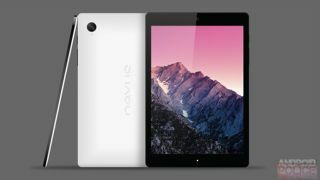 A steady stream of leaks and rumours have started emerging about the Nexus 9 and HTC Volantis, which are largely believed to be the same thing. The latest information comes from @evleaks and it's the most exciting and in some ways dubious information we've come across so far. According to the serial tipster the HTC Volantis will have a silver aluminium unibody and BoomSound speakers, which given what HTC has done with the HTC One M8 suggests that this could be a seriously good looking tablet. @evleaks also mentions that previous renders and concepts of the device were 'fake', so it remains to be seen what it will look like. What's even more interesting though is the rumoured specs, which include a 64-bit Tegra K1 processor (though apparently it's being tested with a Snapdragon 810 processor) and 5GB of RAM, which @evleaks describes as 'non-final', so it may ship with less. That's a serious amount of power if it really does ship with 5GB of RAM. It definitely sounds like overkill, but one of the advantages of a 64-bit processor is that it allows for more than 4GB of RAM, so it's possible that HTC is making the most of it. The Twitter leaker also claims the slate will have an 8.9-inch display and that currently it's equipped with a 1680 x 1050 screen, but that it will apparently ship with a 2560 x 1600 display. It's said to be packed with 64GB of storage and to have a 5MP camera which can shoot in 1080p, though @evleaks theorises that it may ship with an 8MP snapper. Finally, the serial leaker also shared an image of the tablet. It's an extreme close-up, which doesn't reveal much about the look of the slate. Instead it's focussed on two watermarks. One of which reads 'Flounder', which is a code-name that's previously been associated with the Nexus 8, and the other references Android Silver, which further suggests that this is a stock Android device. It certainly sounds like an improvement on the HTC Flyer.